Yesterday, we had more guest visitors for our Sunday morning service. Missionaries Bill and Darla Moxon blessed us with their ministry. The Moxons came to Haiti in 1988 to dig wells. We became good friends with them when our children were small. They are now digging wells of a different kind in the hearts of people and filling them with living water. Bill blessed us with a beautiful message about the Prodigal Son, yet, the emphasis was more on the Father. I never tire of this story. Our Abba Father’s longsuffering, goodness, and forgiveness exceeds our comprehension. He is always yearning for his loved one’s homecoming. Bill had originally planned to preach another message, but the Lord changed his sermon early Sunday morning! It seemed the Holy Spirit was driving home the point that the Haitian people are greatly loved by their Heavenly Father. In a country of great poverty and disappointments on almost every level of society, he reassured them that God’s promises were just as real for them as for anyone else and that the Lord wanted to bless and heal their land. Bill admitted that he had often seen himself as the older brother in the story, always laboring for his father’s approval. But the Lord showed him over the process of time that his love was not one to be earned, but received. It deeply resonated with our assembly. Sunday’s service was very moving from the beginning to the end. Even our worship team sensed a holy presence among us and we all just lifted up our voices to the Lord and waited on him. It’s such a privilege to be friends with some of the most consecrated people we know. 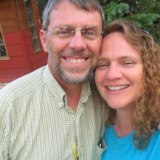 Bill and Darla’s hunger for God is intense and their love for the Haitian people is evident to all. If you would like to learn more about the Moxons’ ministry, please click here to download a copy of their newsletter. We would highly recommend them to anyone looking for a missionary couple to support.